The injuries suffered from a construction site accident can be severe and may lead to a permanent disability that can prevent an injured worker from being able to return to work and continue to support their family. Many construction workers do not know that in New York, there are laws that specifically protect them who fall from any height, or are injured by a falling object, or when the worker is not provided with the proper safety equipment. These laws help protect construction workers by providing a settlement in addition to Workers' Compensation, even if the injured worker was partially responsible for the unfortunate accident. Under New York Labor Law Section 240, injured workers and their families can sue property owners, contractors and other parties who are responsible for injuries and accidental deaths that have been caused by a dangerous construction site. There is no question that construction work can be a hazardous trade. 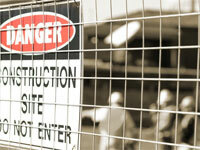 Due to this fact, federal and state laws strictly regulate workplace safety at construction sites. If you've been injured on a job site, the general contractor or your employer may has have failed to protect your safety in accordance with the law. Perhaps the contractor did not follow mandatory safety precautions or perhaps you were operating defective or improperly maintained machinery. Whatever the reason, we are ready to protect your interests and help you claim the benefits and compensation that you are owed. Stephen Bilkis & Associates are highly experienced personal injury attorneys. If you have been injured in a construction accident, and are in need of a New York construction accident lawyer, call us immediately at 800.696.9529 for a free consultation.